Hoffman Beach offers a broad sandy beach for sunning and relaxation, a large protected swim area, 2 lifeguard stations, restrooms, snacks & ice cream. Swim lessons are offered in July. Swimming is permitted only while lifeguards are on duty. Birthday Parties - During the swim season, consider having your child's birthday party (20 guest max) at Hoffman Beach contact Debbie Orme at lppoabeachrental@aol.com for more information. Come join the fun! 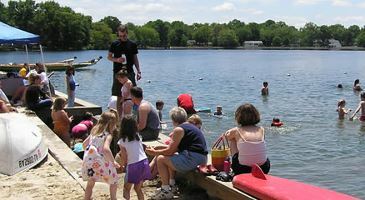 During the season, see a beach manager to purchase your membership. 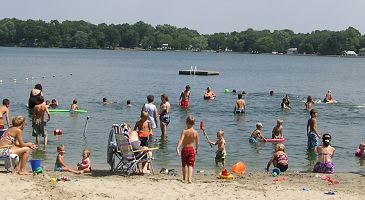 Drewes Beach offers a large sandy beach for sunning and relaxation, a swim area protected by a lifeguard station, restrooms, swings, volleyball court and horseshoe pits. Swimming is permitted only when lifeguards are on duty. 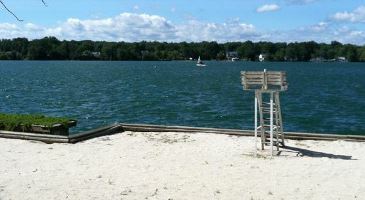 Johnson Beach offers a quiet sandy beach for sunning and relaxation. Sit back, relax and read a book, take in the sun or just enjoy the wonderful views. This beach has restrooms and swings.